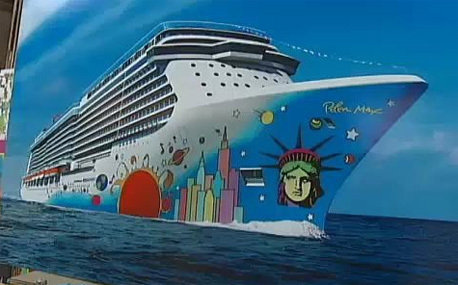 The next stage of the carefully-choreographed release of information about cruise ship Norwegian Breakaway is scheduled for tomorrow, with the big reveal of the hull artwork, designed by illustrator Peter Max. But the official announcement has been pre-empted by the artist himself, who went on his local TV station in New York at the weekend and revealed what he was planning – appropriately enough a tribute to the Big Apple, where the ship will be based, with a multi-coloured skyline and the disembodied head of the Statue of Liberty. Snatched images have begun floating around the internet, but when I spoke to NCL’s public relations agency today, I was told that none would be made available until it has been approved for release tomorrow afternoon. 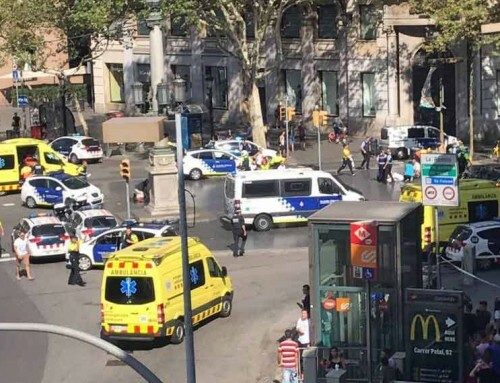 I hope chief executive Kevin Sheehan doesn’t have a last-minute change of mind when he sees what has been planned by Max, if indeed this does represent his design. Max, who was a babe-in-arms when his parents fled from Nazi Germany in 1938, designed psychedelic posters and record sleeves in the 1960s, and was official artist for the 1994 World Cup. His previous work also includes the livery for a Continental Airlines Boeing 777 jet. The 4,000-passenger Breakaway, under construction at a shipyard in Germany, will be launched next year. 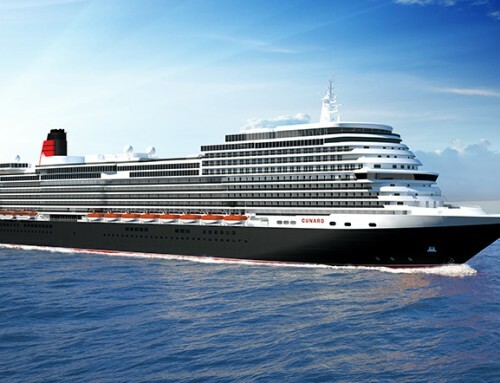 The maiden voyage, a seven-night Transatlantic crossing to New York, is scheduled to leave Southampton on April 30. Is there a war on – “under construction at a shipyard in Germany” – sounds like “at an East Coast port” – do they mean Meyer Werft by any chance? Since their problems with STX France it seems NCL give no quarter to shipbuilders! Seriously though, I hope the other side of the hull has Bermuda and the Bahamas on it, as Norwegian Dawn had New York on one side and Florida on the other to cover her seasonal employments. And as Breakaway will be a year-round New York ship, will they engage a Miami artist for the Norwegian Getaway, to be based in Miami? “Under construction at a shipyard in Germany” is my phrase rather than NCL’s, and chosen because (rightly or wrongly) I believe most of my readers would not be as familiar with Meyer-Werft’s activities as you and I, Kevin. 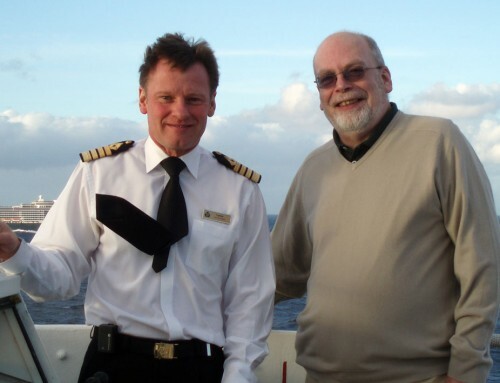 The number of cruise passengers who know – or care – whether their ship was built by M-W at Papenburg, by STX in Turku or by, say, Chantiers’ d’Atlantique in St Nazaire is a small minority. I usually use a similar phrase – “… at a shipyard in Italy,” when referring to Fincantieri builds, rather than specifying Monfalcone or Marghera. I generally make an exception when reporting on float-outs or conveyances when the location is possibly more germaine. On the subject of Breakaway’s hull art, I am keeping my fingers crossed that the apparent revelation by Peter Max is in fact genuine and was not a spoof. We’ll find out later today. Probably because I’m an old fuddy duddy, I have to say I dislike the painting of a ship as if it’s a children’s toy! My preference would be something like Cunard, a straightforward, simple colour contrast that is easily recognisable from near or far. The childish (in my mind) hieroglyphics do nothing to make me want to sail with this line, in fact, it makes me think they are not a serious concern at all. I have to agree with Geoff Stevens, while I really like Peter Max art work, Id rather see it on my wall, not on the side of a ship. I find it rather garish and silly looking. I’m not an old fuddy duddy, but I agree with this comment.It actually makes the cruise line look “cheap” in a not very nice way. Just saying.